Just confirmed: The CIA will be playing at the Maritimer 11 April 2009. Show starts at 9:30 pm, with special sit-in guest star ryan fitzpatrick (of The Ogden Owls) and more TBA. We'll be debuting some of Elise's songs that night, too. This just in: The Pickled Hicks play The Maritimer Tonight. James may get up and sing a Hank Williams tune or two. Time: 9PM. Just learned from the organizers of Papa Wheely that tickets to their Dreadful Gestalt show will be advance only. They're $20, and if you want one, please mail info@jamesdangerous.com, or get in touch with Papa Wheely. Also, James might be sitting in with The Pickled Hicks again soon, as word on the street has it (actually, James ran into Jeff on the street). If you missed the last two sit-ins, catch one of the upcoming ones: they're always a hoot and a holler or ten, and James does his best to live up to the Hicks' motto: "Never stop in the middle of a Ho'-down." Details TBA. Lastly: SWAG coming! If you've seen our updated front page, you'll know what our big waterproof sticker looks like . . . but did you know there's a button coming too? (Hint: you can get to the front page at anytime by pressing the . in the top left corner of the webpage. )give us a shout if you'd like some swag: we'll see what we can do! Eleventh Transmission interview with downloadable music up in our new "press" section. More tidbits coming soon! Uncle John's Band: Erin Ross and James Dangerous co-lead Uncle John's Band, hosting Vern's open mic. Vern's, 26 Feb, 622 8 Ave SW, Calgary. 8:30 pm. The Ogden Owls: ryan fitzpatrick recruits Jocelyn Grossé, Laurie Fuhr, Dylan Sadlier-Brown, and James Dangerous for a wild show. The Marquee Room, 612 8 Ave SW, Calgary, TBA. Update 12 Feb 2009 – *SHOW* NoD Magazine Launch† Featuring NoD Magazine co-editor IAN KINNEY! 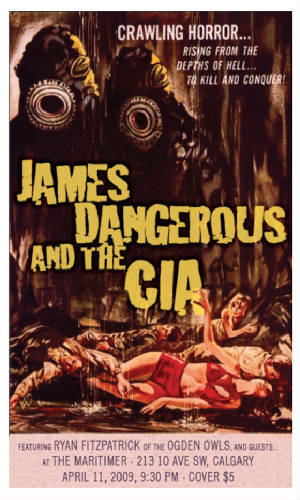 guest starring James Dangerous and the CIA. † "Nod" is spelt with the orthographic "–" over the o, and is pronounced "node". Update 22 Jan 2009 – New pictures up in the Gallery: thrill second-hand at the glories of the Owl Howl, or relive your glorious owl-saving glory! Seriously, though: best CIA live shots yet. Also, Micah Stone, Devin Bates, The Ogden Owls, The Pickled Hicks, and Erin Ross are featured. Update 15 Jan 2008 - James will be sitting in with The Pickled Hicks at the Ironwood. The show starts at 8pm. While James will only be playing a few Hank Williams tunes, the Hicks are a never-miss proposition!